People stop to pay tribute following an attack last week that left 12 dead at the offices of the satirical magazine <em>Charlie Hebdo</em> in Paris. To answer the question most narrowly, there was no march after the Kunming knife attack because Chinese people in Kunming did not march. 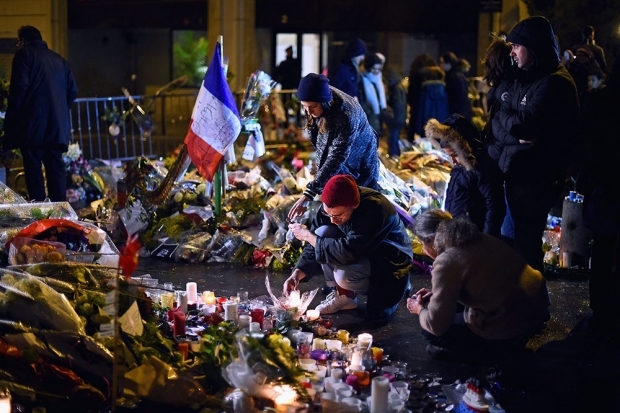 French government and society openly embraced outward expressions of mourning and actively welcomed foreign heads of state and representatives to join in. The families of the Charlie Hebdo attack’s victims led the Jan. 11 march in Paris with the support of French President Francois Hollande, who invited a number of world leaders and called upon all French citizens to participate. The response was stunning; up to 1.6 million marched in Paris, according to French officials the largest demonstration in French history. There was, however, no Kunming march; families of the victims organized no massive vigil; President Xi Jinping did not call on all Chinese citizens to join him and other world leaders in a march through the streets; Xi did not address the gathered crowds and proclaim that ‘Today, Kunming is the capital of the world.” Such a great show of public unity in the face of terrible grief would likely have attracted greater global attention. But these or similar events did not occur, because Chinese authorities would have been unlikely to approve mass gatherings that touch on the sensitive issue of domestic terrorism. On March 3, a candlelight vigil near the scene of the attack drew around 100 people; this, in a city of over 6 million. But the question is really a broader one: why didn’t Western countries demonstrate greater solidarity with China after the Kunming knife attack? Here, Chinese censorship and the Great Firewall play an important role. French citizens share numerous social media platforms, notably Twitter, with millions of others worldwide. When a French artist created a hashtag #JeSuisCharlie and it started to trend on Twitter, people around the world were able to easily notice and join in the online solidarity. But by blocking Twitter, Facebook, and YouTube in mainland China, Chinese authorities have consciously and purposefully cut off Chinese Internet users from social media platforms widely used in the rest of the world. This makes it much more difficult for people outside of China to share in online solidarity with events close to the heart of Chinese netizens, as the Kunming attack clearly was. In addition, the aura of authoritarian reach surrounding the reporting on the Kunming attack, as well as suppression of social media reactions, created initial skepticism among outside observers as to the true nature of what had transpired in Kunming. China’s tightly controlled media were instructed to run only state-sanctioned reports, and avoid large headlines and gruesome photos. Witnesses to the knifing posted photos on Chinese social media, but censors quickly went through and deleted these photos and other non-sanctioned personal accounts of the brutal attack. Authorities quickly pinned the blame for the attack on “Xinjiang separatists” yet provided no evidence for this claim; as Western media outlets could not independently verify this, they were slow to adopt the language of terrorism. But Chinese netizens swiftly noticed this reluctance and slammed it as a Western “double standard.” Some in China seem to remain unaware that Western media did later call the attack an act of terrorism, and resentment continues to simmer in Chinese social media—as the online reaction to the Paris march demonstrates. As a Chinese citizen who observed both attacks and their social media aftermath from afar, I find it impossible to shake the impression that the “Western” reaction to Paris was indeed immeasurably more visceral and passionate than the reaction to Kunming. It may be somewhat attractive to blame this on the relative paucity of information on Kunming, but it is also true that, even after the basic facts of the knife attacks were fairly well-established, they never triggered anything remotely close to the level of (Western) grief or outrage that immediately followed the Paris shootings. There is also a strong likelihood that, among the many millions of Facebook or Twitter users who reposted “je suis Charlie,” only a minority had more than a cursory knowledge of the shootings, and only a tiny minority bothered to investigate their broader social or historical context. The Western online reaction to Paris was knee-jerk, emotional, and explosive—as it certainly should have been. The reaction to Kunming was, by and large, none of those things. At the same time, there really is no reason to either expect or demand that Western audiences have a similar reaction to both incidents. I am among those who believe—reluctantly—that emotional discrimination against perceived “others” is, for lack of a better term, human nature. For all the talk about globalization since the 1990s, it is probably no exaggeration to state that, to most Westerners, China remains a culturally inaccessible, ideologically foreign “other” that simply does not generate the kind of instinctive familiarity and sympathy that other Western societies do. Scholars have many concepts and theories to describe the intellectual and societal consequences of this “otherness”—orientalism, Eurocentrism, and so on—but it would be deeply misguided to believe this is a uniquely Western phenomenon (or, for that matter, a modern one—the in-group versus out-group mentality is as old as human history). As much as Chinese netizens might lash out against perceived Western apathy, they themselves did not necessarily flood Weibo with principled outrage or grief towards the Paris shootings. They might argue that this was simply a response to the Western reaction to Kunming, but that is an unsatisfying explanation either from an intellectual or moral standpoint. To claim that “Western cultural and political imperialism”—or the “autocratic nature of the Chinese party-state”—makes it difficult to emotionally respond to Paris or Kunming as one would to a similar incident within one’s own cultural sphere is not so much a refutation of the “otherness” thesis, as it is an affirmation of it. Whether emotional discrimination against “others” is normatively desirable is a more difficult question. It seems to encourage conflict, and runs against many of our more exalted moral ideals. At the same time, it encourages group solidarity, facilitating the kind of societal discourse and cohesion that often makes those exalted ideals possible. It may also be a fool’s errand to morally justify (or attack) what may be, for better or worse, human nature. What is the more effective approach in dealing with acts of terror by homegrown elements? What role can enlisting international demonstration of solidarity play? There can be no simple answers to such questions. Back in March 2014, when the slashing of innocent passengers at the Kunming railway station took place, China’s public media—in my personal memory at least—broke tradition in several ways. For example, there was no effort to publicly identify groups those individuals may have claimed to represent. This treatment can take away the possible wish on the part of such group(s) (if actually existent in this particular case) to have free publicity for their ideological campaigns. Also downplayed was the ethnic background of the killers. Doing so can help reduce racial tensions among the populace in China. Over the Kunming incident, there was a general refrain from pointing to ‘external forces’ or foreign influences as the extended source of problem. In short, there seemed to be a turn to defining such acts as unacceptable criminality, pure and simple. I am not as active as I should perhaps otherwise be on social media. But I suppose, for China, the more tangible challenge is not so much in international observations about the predicament the society is in. International solidarity against terror can be helpful, but to what degree that can be effectual is harder to ascertain. Even on the domestic front, public demonstrations against a small number of individuals and their supporters may instead have a negative impact on inter-racial relations, already tense in some parts of the country. More investment should go to preemptive policing and quick response. Coming back to the Kunming-Paris comparison, innocent victims suffer, regardless of place and nationality, and deserve sympathy regardless. It is the nature of the crime, not the number or nationality of victims involved that should be true source of bonding between the mainstream of societies. For China and France, and by extension the wider West, such crimes in Kunming and Paris should be turned into an impetus for further collaborating in international efforts to track and stop them. It did take some years for acts like the killing in Kunming to be counted as terrorist ones in media reports and analyses outside China. The recent turn in discussions about gaps in solidarity demonstration is a welcome change. Again, hopefully, knowledge about such gaps will lead to more effective cooperation over a common cause: the fight against terror. The only thing I would add to Bethany’s excellent remarks is that the Paris demonstrations were not against terrorism. To be sure, most people in the West oppose terrorism, just like most people in China. But Western publics do not march every time there is a terrorist act. The French people turned out in vast numbers because they perceived this particular act as an attack on the cherished value of freedom of speech. The only time I can think of when Chinese people were able to demonstrate in favor of freedom of speech was when a small group of protestors demonstrated against official interference in the editorial policies of Southern Weekly in Guangzhou a couple of years ago. But so far from being encouraged by the government, that demonstration was quickly squashed. A debate has now sprung up in the West in the aftermath of the Paris demonstrations over whether insults to Muslims’ religious beliefs deserve to be protected as free speech—and there’s a subsidiary debate over whether Islam really does ban graphic images of the Prophet—but we see no effort on the part of Western governments to interfere in these debates. National publics in France, Germany, the U.S., and elsewhere will find their own consensus points on these issues over time through democratic processes. People are also talking about how social discrimination and Islamophobia may help to explain the appeal of terrorism to some Muslim youth. No one defends the use of murder as a response to offensive speech, but Western publics are willing to ask how our own policies contribute to despair and alienation in some communities in our midst. I would love to see a conversation like that spring up in China to probe the causes of growing despair among Uyghurs and Tibetans. Most tragedies go barely noticed by the world. Terrorism gets more attention because media-fed spectacle is its goal. But even then, the vast majority of attacks, especially outside the West, disappear into the general flow of human suffering with barely a ripple. Charlie Hebdo was different because the victims represented ideals and traditions behind which others, even those who did so hypocritically, wished to rally. The raucous French legacy of satire and anti-clericalism, the right to speak freely and without danger, even if it offends others, the dream that the pencil might be mightier than the sword; whatever qualms some might have about some aspects of these, all recognize their power. The current Chinese system has no ideals capable of inspiring such affection across national borders, especially among the creative classes who are the bedrock of soft power. At best, the values it promotes are parochial and somewhat dull, at worst they are vicious and xenophobic. No Egyptian novelist has been inspired by the great rejuvenation of the Chinese nation, no Chilean cartoonist looks to the Chinese dream, no French filmmaker was moved by Hu Jintao's already forgotten harmonious society. And the system has no tolerance for those who might produce or represent different principles, even ones rooted in Chinese tradition, that might stir dreams elsewhere, save for the pallid revival of officially-sanctioned "Confucianism." The only figures that might win acclaim elsewhere for what they stand for are exactly those whom the government attempts to crush. Moreover, even those stories that make it to China's front pages are not permitted room to breathe. Scandals and tragedies that in other countries would run for months, for good reason, are disappeared within days or at best weeks. In China, the debate around terrorism, such as it is, has been behind closed doors, amid experts and officials. The French discussion on Islam, terror, and its colonial legacy may be incomplete, it may turn to vicious ends, it may be self-serving. But there will be a discussion, and the world will listen to it. The killing of hundreds—some say 2,000—innocent civilians in Nigeria by Boko Haram has not received nearly the same reaction in the Western world as did the Paris attack. This is just the latest example. There are countless examples that the huge losses of civilian life in the wars in Iraq and Afghanistan, whether they are perpetrated by suicide bombers belonging to radical extremist groups or by NATO forces, have barely been covered by Western mainstream media, while the shooting of one in the U.S. would have CNN working on it 24-7. For example, the U.S. often claims its drone attacks are killing militants but never has said that the wives and children of the militants often die as collateral damage during the attacks. As for Kunming, the question should really be directed to Western leaders. Why didn’t they immediately condemn those terrorist attacks against innocent civilians in Kunming and Xinjiang after those horrible incidents took place? Silence in the face of such terrorist attacks is simply condoning the murders. China and the U.S. now share common interest in fighting terrorism, but one huge difference seems to be that some Americans still believe that only those setting off bombs in New York are terrorists while those who detonate explosives in Beijing among civilians may or may not be. To be blunt, as a journalist, the lives of Americans or French are worth much more than those in China, Nigeria, Iraq, and Afghanistan. That’s the sheer double-standard and hypocrisy of the West. The decade-long War on Terror has clearly resulted in more terrorists in this world. The U.S.-led coalition may have launched more than 1,000 airstrikes against ISIS in the past months, but it did not do much to address the root cause, which I believe is the absolute key to solving the issue. As a journalist, I totally defend the freedom of the press and condemn the attack on Charlie Hebdo. Yes. China’s record in upholding freedom of the press is not perfect and is still an evolutionary process. But at the same time, most people have ignored the news that French authorities last week arrested 54 people for exercising their right to freedom of speech, including French comedian Dieudonne M’Bala M’Bala. These people simply posted on Facebook or other media messages that were sympathetic to the Paris attackers. So, while the Paris solidarity rally is defending freedom of speech, the French authorities are doing exactly the opposite. This whole question “Why Did The West Weep for Paris But Not for Kunming?” is really for the West to ponder much more than for the Chinese. The very wording of the question poses a danger of Sinocentrism. As Taisu Zhang points out, the failure of terrorist attacks in China to elicit similar outrage can be seen as unrelated to anything specifically Chinese; similar outrage is also absent whenever terrorist attacks occur in faraway places among people one does not readily identify with. Thus, I’m surprised to see Chen Weihua castigating “the Western world” because killings by Boko Haram in Nigeria have received less of a reaction than the Paris killings; the same could be said of Chinese reactions to Boko Haram killings relative to the Kunming killings. More importantly, however, as other commentators have noted, it would be a mistake to view the protests as a denunciation of terror tactics per se. There have been many other terrorist attacks with far worse results that did not result in massive demonstrations. In the United States itself, neither the Oklahoma City bombing, which killed 168, nor even the 9/11 attacks, which killed almost 3,000, elicited a response like the one we saw from the Charlie Hebdo attack, which killed far fewer. When “the West” and even United States citizens did not come out in massive demonstrations in response to those attacks, it seems odd to wonder why they did not come out in massive demonstrations after the attacks in China. Clearly it’s not just a response to tactics, location, or number of deaths. What I think people find especially disturbing about the Charlie Hebdo attack is that it is an attack on our ability even to talk about certain issues. The typical murder does not by itself impair our ability to prohibit murder and catch murderers. But the Charlie Hebdo attack can, unlike most other terrorist attacks (including the Kunming attack), be seen as precisely this kind of attack on valued social institutions and processes. On a tangential matter, Chen Weihua rather carelessly asserts that the U.S. “never has said that the wives and children of the militants often die as collateral damage during the attacks.” This claim can be easily checked by anyone who cares to do so via a quick google search (I tried “Obama drone collateral damage”), and Mr. Chen should have done so himself. In fact, no less than the President of the United States has publicly and explicitly acknowledged this exact issue. (To be sure, he said “civilian casualties,” not “wives and children,” but I take it the absence of a necessary familial relation to the target does not make the death of innocent civilians less problematic). I found this one counter-example in just minutes; I suspect there are many more.